Kusadasi, which means "bird island" is set in a superb gulf and is known for its tourquise sparkling water, broad sandy beaches, bright sun and large marina with a capacity for 600 boats. A glorious ancient city beside it, EPHESUS with hundreds of thousands of visitors each year. Not far from Adnan Menderes Airport Izmir (only 80 km.). Numerous holiday villages and hotels line its shores and hundreds of restaurants serves food from all around the world. Ofcourse, Turkish Cuisine which is one of the largest cuisine of the world. We mustn't forget discos, bars, caf�s, pubs and "Turkish Nights". All those to cater holiday-makers. Kusadasi has retained a certain earthiness to it and inexpensive meals and pensions can still be found in town. Many carpet and leather shops do a brisk trade with passengers from hundreds of cruise ships that dock for a day or two, allowing enough time for a trip to Ephesus and a shopping expedition. Before Jesus, in the years of 2000, firstly people coming from Lelek, Karia, Lidya had settled down as a society to the slopes of Pilav Mountain. Then one by one with the unit settlements Pigale, Maratheson, Neopolis, Panionion; Ions and later Romans by Ephesus� coming into the dominance of Rome, had lived in these lands. Today�s Kusadasi is founded in 16th century by Venetians being a colony. The castle in small island was built for the purpose of observation in Byzantium term. In the Middle Ages, Kusadasi, being a part, was used by Venetians and Genoeses which had taken the name of Scala Nuova. The city was surrounded by castle walls for being protected from the violence of pirates. it�s known that there�s an Ionion Region of Kusadasi. This had taken an important harbour mission on Asia-Europe trade road throughout long years. In the period of Scala Nuova time, the Armenians dominant to trade, Greeks, Jews had joined to former nations. Turks with the Malazgirt War in 1071 had started to spread on Anatolia and during the process of Turkish principalities� formation, in 1304 Sir Sasa had been the authority of Kusadasi and around. Sir Mehmet had connected this vicinity to Aydinogullari with Sasa�s dying. Kusadasi is a harbour town and Turks had beared this in mind. Although they were from Middle Asia source and far away from maritime business, they had learnt maritime as well as the Ephesus� in a short time. They had lived comfortably with the spoils they caught at sea wars. Kilic Aslan had added this place to Selcuklu Goverment and Scala Nuova again had become the exportation gate of Anatolia in 1186. Yildirim Beyazit had joined Ayasulug to his principalities and in this way the city had been Ottoman�s in the year of 1390. Timur had decided to take the whole Anatolia under his sovereign but when he could not take Ayasulug, he had fired the castle in which Ottoman soldiers resisted himself. And St. Jean Church had damaged from this event very badly. By I. Celebi Mehmet Kusadasi had gathered to Ottoman�s and it had become a district. With the vicinities� passing to Ottoman, Turks had entered to societies in these places. At the end of 1st World War, Ottoman Government had overcome, so Kusadasi had given to Italians, and because of this, Italians had added to Turks, Greeks, Jews, Armenians. All these minorities had left our country on 7th September in 1923 with the winning of independence war, and later connecting to remaining nation, the mixture bringing by the exchange way, a new society had formed, and with the treasure lands from Guzelcamli to Selcuk, the estates of Greeks which went had given to these immigrants in return to their properties there Afterwards some of the Turks came to Anatolia had gone back to places they came again, but this migration had repeated of the 2. World War. 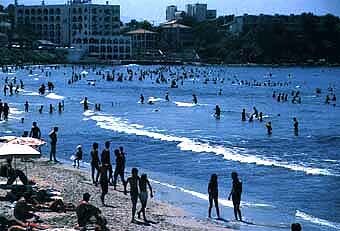 This migration had taken place since 1941 to 1955 and thus today�s people of Kusadasi had started to form rapidly.